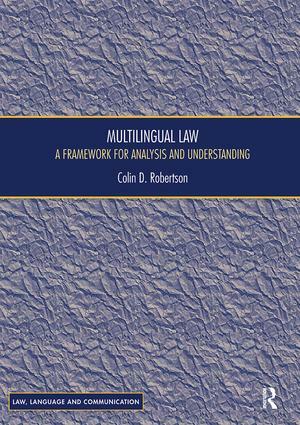 This book introduces and explores the concept of multilingual law. Providing an overview as to what is 'multilingual law', the study establishes a new discourse based on this concept, which has hitherto lacked recognition for reasons of complexity and multidisciplinarity. The need for such a discourse now exists and is becoming urgent in view of the progress being made towards European integration and the legal and factual foundation for it in multilingualism and multilingual legislation. Covering different types of multilingual legal orders and their distinguishing features, as well as the basic structure of legal systems, the author studies policy formation, drafting, translation, revision, terminology and computer tools in connection with the legislative and judicial processes. Bringing together a range of diverse legal and linguistic ideas under one roof, this book is of importance to legal-linguists, drafters and translators, as well as students and scholars of legal linguistics, legal translation and revision.